It’s been a while since I’ve added significant non-blog content to Sinosplice, but I’ve just completed something that could be really useful to learners of Mandarin Chinese. That something is Mandarin Chinese Tone Pair Drills. I actually began this project all the way back in 2003. I put my ideas together into a rough form and some friends (including John B, Brendan, Greg, and Alf) helped me test them out. They gave me good positive feedback, but I felt the whole thing still needed a fair amount of work. I didn’t find the time and inspiration to finally put in that necessary work until this month, almost three years later. I spent a good chunk of my October holiday working on it, and quite a few nights over the past few weeks. 1. The words chosen are random words, both in terms of part of speech as well as level of difficulty. 2. There is no clear method for how to use the tone pairs to improve one’s tones. 3. There is no clear connection between the tone pairs and actual speech. 4. They often rely too heavily on visuals (tone marks) to teach the tone combinations. I tackled these problems in several ways. 1. I focused on adjectives, which are both highly likely to be useful in elementary conversation, as well as plentiful in almost all tone combinations at the elementary level. 3. Following the method progressively will eventually result in practicing useful, grammatical sentences. 4. I included audio files for all the words in the drill, both in simple clickable online versions, as well as in downloadable MP3 versions with playlists for drilling and quizzing. I also licensed the method using a Creative Commons license, encouraging others to build on it. The method I developed is labeled as a “drill.” As such, there is definitely plenty of room for it to be built on using a Chinese teacher’s experience and a little creativity. I should also stress that the drill was designed to be practiced with a native speaker Chinese tutor, but I still believe it can be useful even without the guidance of a tutor. I welcome your feedback. I do expect to update and improve this feature over time. I’ve played piano for many years, and I’ve always told people learning Chinese that mastering the tones are just like playing the piano. You have to just recite them over and over in pairs. Do it enough, and it just feels natural. Who’d have known Beethoven and Mandarin had so much in common. Yes, tone pairs are good. But 3 third tones in succession can be awkward and tone pairs don’t help. You posted a long time ago a JPG I sent you from a book published in China explaining how combinations like hao3yu3san3 should be pronounced hao2yu1san3. Do you remember? (This is because of Tone 2 Sandhi, which no Chinese teachers seem to have heard of. In this case yu3 becomes yu2 due to Tone 3 Sandhi, and then yu2 become yu1 due to Tone 2 Sandhi). OK. I have listened to the lot. I think it would help people in the first six months of studying Chinese – but the real difficulty is combining tones in running speech, as I pointed out with three 3rd tones together. In speech, no Chinese person pronounces the tones as in the MP3s – they are good MP3s of isolated words, but I’ll buy you a bottle of Qingdao if you can find one Chinese person who pronounces 真 as in the audio files. 55 may be the tonal value of the isolated word, but in running speech it may be 44 or something else, as the tones assume more of a wave form. In fact, the MP3s themselves do show variation in tonal value: 黑,干,酸,新(pronounced xing1 on the audio) are all pronounced 55 whereas 轻is pronounced 44. The resource is good for very, very basic Mandarin, as long as it is understood that speaking in whole sentences is another kettle of fish altogether. Now if you looked at 新编普通话教程 by 浙江大学出版社 and decided to produce a resource describing the intonation of running Mandarin (sentences, not words), that would be something really great! You bring up a lot of valid points, and I think there are two central ideas here: (1) how much explicit instruction learners need to produce tones naturally, and (2) the relationship of “model pronunciation” to more realistic (as heard “in the wild”) pronunciation. On issue #1, it’s clear that you favor extensive explicit instruction on pronunciation all the way to the most advanced levels, but I think very few learners do. The human brain is an amazing language acquisition machine. While the brains of children (given plentiful input) acquire language the best, adult brains are still language acquisition “machines.” I think too much explicit instruction is not only boring and frustrating, but it’s also unnecessary. Given sufficient instruction and exposure to the target language, motivated learners will naturally acquire the more advanced features of pronunciation. On issue #2, I think it’s always an issue. No one wants to learn from a model that sounds “too much like a textbook,” but if it’s too realistic, it’s too difficult and frustrating for the beginner. One must always strive for the correct balance. Adjusting this balance is something I intend to do in updates. Note: The audio files included with this drill are designed mainly for help with steps 1 and 2. Native speaker guidance is highly recommended when practicing the remaining steps. As I mentioned to you before, I’ve been working on a similar thing for my site and unfortunately at a similar rate. I.e., I probably won’t actually get mine finished for another two years! One thing I noticed, is that you’ve put quite a bit of time into the presentation as well as the utility of the pages. Did you make all the artwork and the flash buttons for the mp3s yourself? Also, is the Sinosplice Merchandise thing where you sell T-shirts new? I like the “Please speak Mandarin” one. Yup, both the Products page and the merchandise is new. 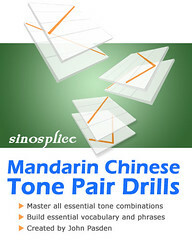 Sinosplice has a new feature: Mandarin Chinese Tone Pair Drills. Users who have found that website’s content useful in the past should probably give it a look. wow!! i’m impressed! i don’t understand what it all means, but clearly you do (as do others in your field), and that’s what counts. way to go! my brother is BRILLIANT, i tell you! I’ve been reading your blog for almost three years, and it helped motivate me to come to China. (Now in Changchun). Second, I would be very interested in an ancillary article on tutoring, from the tutoree’s point of view. How can I “instruct” someone to tutor me well, what different strategies (like this tone drill) are most efficient. Just reading a text (once), and getting corrections hasn’t helped me much so far. Hope this makes sense. I’ve been trying to think of many ways to interact with a tutor (having them write emails, SMS messages), make up little stories, or directions on how to go places, etc. My tutors are very nice, and motivated to help me, but I have no experience teaching another language, nor with learning one-on-one. Thanks again for your site and dedication. Thanks very much for the constructive feedback. I think you’re totally right; I should have included Chinese instructions for the tutors. I will definitely add them to the next release. Your other idea is also well worth exploring. One of my hopes in creating this tone drill was that others could create exercises which utilize the tone drill content in a fun and innovative way. I might eventually do something like that myself. Your effort is much appreciated. An excellent, free resource, good for someone in their early stages of learning, or perhaps as a refresher for someone a little further on. That being said, I find that a few repetitions of many words is much more effective than many repetitions of a few words. I used the former method to learn Thai pronunciation. It worked very well. The latter method doesn’t do much for me, beyond introducing me to the correct pronunciation. I’m one of those over intilectuals that have to understand ‘why’, i’m learning something before Ill even make an attempt at it. I get this impression, – that the reason I am getting on as well as I am here in china so far, is because by instinct, I am ‘speaking’, making up language when I need to, but matching my pitch to my emotional-intention. -and when you actually need to SAY something, so many people speak English everywhere in the world it’s a crime. (and yes in Greece I actually leared to speak Greek not what I’m discribeing above ;z) but that and other experiences living in C. America gives me the courage to hack it I guess. I think if I get the tones down, learn the rest of the articals, and some tenses, I’ll be farther along faster then expected. ps. thank God we know that people (in general..) all talk about the same stuff everywhere all the time anyway right? pss. I to want to have a guide on how to instruct instruction I get. Becuse lots of people WANT, to teach me but they have no friggen idea. it’s a joke, – would need to be written in En&Ch.